Zhejiang Province has traditionally been the bastion of entrepreneurship and a major textile base in China. Located in the southern part of the Yangtze River Delta, Zhejiang has an area of 101,800 square kilometers and borders Fujian on the south, Jiangxi and Anhui on the west, Shanghai and Jiangsu on the north and East China Sea on the east. 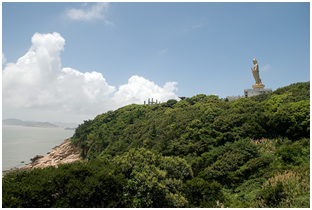 With an extensive 6,486 kilometers long coastline and numerous bays, Zhejiang has 60 natural ports. Hills and mountains account for 70.4 percent of the total area of the province. The number of islands in Zhejiang amounts to 3,061, which is the largest number in China. Zhejiang is derived from the old name of Qiantang River called “Zhe” river. 2. Traditionally known as the "Land of Fish and Rice", this province is nowadays famous for its ‘Zhejiang Model of Development’, where small businesses have grown to mass produce low cost goods that meet the needs of large international and domestic markets. Its capital Hangzhou, has been continuously ranked by Forbes for the last five years as the best city in China to do business. The province is also famous for its booming one industry towns (Wenzhou-shoes, Datang-socks, Qiaotou-buttons, Diankou- hand tools/hardware, Yiwu- world’s largest sales hub for small consumables). 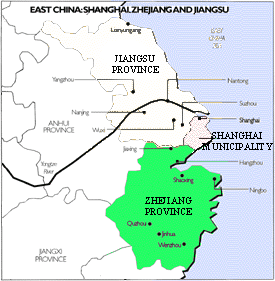 It has 2 cities of vice-provincial government level namely Hangzhou and Ningbo, 9 cities of regional level namely Wenzhou, Huzhou, Jiaxing, Shaoxing, Jinhua, Quzhou, Zhoushan, Taizhou and Lishui, 36 counties, 22 cities of county level, 32 urban districts subordinated to different cities, 837 towns, 562 villages and 212 residential districts. 4. In September 2016, Prime Minister Shri Narendra Modi visited Hangzhou, capital of Zhejiang to attend the G20 summit. On the sidelines of the summit, Prime Minister held bilateral talks with President Xi, Australian PM, British PM and Argentinean President. Hon’ble Minister of Telecommunication Shri Manoj Sinha visited Hangzhou to participate in the BRICS Telecommunication Minister’s meeting. 5th BRICS Science, Technology and Innovation Ministerial meeting was held in Hangzhou on 17-18th July 2017. An Indian delegation led by Director National Institute of Advanced Studies participated in the meeting. The meeting of BRICS Heads of Tax Authorities was held in Hangzhou from July 27-28, 2017. Xia Baolong, Party Secretary visited India in November 2014 with a 100 member Business delegation from Zhejiang from agriculture, automobile & auto components, banking & finance, construction & building materials, environment, food & beverages, healthcare/cosmetics, industrial products, IT, infrastructure & real estate, leather, logistics, machinery, manufacturing, pharmaceutical. He visited Ahmadabad and agreements estimated at $2.5 billion were concluded between Indian and Chinese companies during the visit. The delegation also met Finance Minister Arun Jaitley. He participated in the closing ceremony of Zhejiang Intangible Cultural heritage exhibition in New Delhi. He met chairman of CII on 26th November 2014. He also met Minister of State for Foreign Affairs and Minister of Commerce and Industry. 5. A sister city agreement was signed between Lucknow and Wenzhou, Zhejiang. As per the MoU exchanges and cooperation in various forms in the fields of trade, culture, education, tourism between Wenzhou and Lucknow will be conducted. As a follow up to the same, a Dialogue forum focusing on cooperation in the Leather Industries sector between Lucknow and Wenzhou was held in June 2017 in Wenzhou. India was “Guest of Honour” country in Yiwu Imported commodities fair and India culture week (6-12th May 2017) was jointly organized at the opening ceremony of the fair. A photo exhibition of Gandhi was organized during the Yiwu fair. 6. Gupta Art exhibition was held at Zhejiang Provincial Museum at Hangzhou in June (15th June 2017). The art exhibits from India consisting of 56 sculptures from the Gupta era from 9 museums in India were on display in Hangzhou. Along with the Gupta art exhibition, Calligraphy rendition of Chinese translation of Bhagavad Gita was held under the title “Rendezvous in Hangzhou-Calligraphy Works from Bhagavad Gita”. The exhibitions were part of India culture week at Hangzhou which comprised of an India- (Hangzhou) China Business forum, painting and art exhibition, food festival and film festival. In the painting exhibition nearly 200 plus oil paintings drawn by a group of leading artists’ from Eastern China region who had earlier visited India in March at the invitation of ICCR was on display. 7. The 2017th 3rd International Day of Yoga event was organized in ten cities across Eastern China. The curtain raiser for the event was organized at Wuyi (19th May) and Huzhou (20th May) with participation of nearly 1000 Yoga lovers in each of the two cities. The other cities in Zhejiang were Lishui (10th June), Tonglu (17th June), Wenzhou (18th June) and Jiaxing (22 June). 8. Bilateral trade with Zhejiang province in 2017 was US $ 12.32 billion, up by 19.8% over the corresponding figures of 2016. Of this Indian exports accounted for US $1.45 billion, an increase of about 92.6% as compared to 2016 figures. Exports from Zhejiang stood at US$ 10.87 an increase of 14.2% over the same period last year. The main items of import from Zhejiang to India were textile yarns and products, steel and plastic products; the main items of export from India to Zhejiang were diodes, plastic products and textiles and imported commodities were copper, iron ore and textiles. 9. In 2017, Zhejiang has approved a total investment from 109 companies to India with a total investment of 530 million US dollars of which $440 million is from China. The investments are mainly in the wholesale, general equipment manufacturing, electrical machinery and equipment manufacturing and other industries. Many prominent companies from Zhejiang are present in India and doing business with a large cross section of Indian companies in various sectors such as power generation, systems, air separation plants, pharmaceuticals, chemicals, textiles and cellular technology. This includes Hangzhou Steam Turbine Co.(HTC), Hangzhou Qianjiang River Electric Group Co. Ltd. (QRE), Hangzhou Boiler Group Ltd., Zhuji Hengnuo Electromechanic Manufacturing Co. Ltd., Zhejiang Topsun Group Co. Ltd., Hangzhou Hangyang Co. Ltd., Sinochem Ningbo Ltd., Sinopec Zhenhai Refining and Chemical Company , Ningbo Bird, Zhejiang New Jack Sewing Machine Co. Ltd., Zhejiang Yankon Group Co Ltd., Jushi Group Co. Ltd., Supcon, Longsheng Group Co. Ltd, Hangzhou Chunfeng Industry Co., Hangzhou Hangyang Co. Ltd, Zhejiang Hang Xiao Steel Structure Co. Ltd etc. 10. Chinese e-commerce giant Alibaba Group Holding Ltd. and its financial affiliate have jointly invested about $575 million in India’s One 97 communications Ltd’s online-payment and marketplace businesses in 2015. It has invested once again at the end of 2015 to buy 20% stake in Paytm, a company that grew out of One97. At the end of 2017 there are talks of Alibaba investing $200 million in Bigbasket by which it will acquire 25% stake in the company. Alibaba plans to invest a total of 1 trillion by 2020. The company is looking to enter the Indian market in the logistics company specializing in deliveries. 11. Other major projects include: Ningbo Jide Electric Co., Ltd set up Indian Nobe Model Co., Ltd with the total investment of 55 million USD, providing metal products. Zhejiang Wanfeng Motor Co., Ltd set up Indian Wanfeng Aluminum Wheel Co., Ltd with the total investment of 52.677 million USD with a focus on wholesale industry. Zhejiang Lonsensteel Corporation set up Lonsensteel KIRI Chemical Co., Ltd with 30.87 million USD, with a focus on the chemical fiber industry. 12. IN 2017, India has set up 374 enterprises in Zhejiang with a contractual foreign investment of 280 million US Dollars and a real foreign capital of 150 million US dollars. The investment s are mainly in the wholesale, general equipment manufacturing, electrical machinery and equipment manufacturing and other industries. 13. Zhejiang was uniquely associated with India’s participation in Shanghai World Expo 2010.The bamboo for construction of the central dome of Indian pavilion was procured and processed at Xin Li Yuan Bamboo Products Company in Anji County in Huzhou city of Zhejiang. With a diameter of 37 meters, the central dome of India Pavilion which depicted the Sanchi Stupa, was the largest free standing dome made of bamboo in the world. 14. The province has a sizeable Indian community of around 4000. The number of Indians in Hangzhou has grown now to about 200 including 100 students at Zhejiang University. In nearby Shaoxing, there are 1800 Indians, mainly in the textile business. They have organized themselves into the Shaoxing Indian Business Association (SIBA) which organizes regular business meetings and cultural activities for the Indian community. Yiwu, the city for small product manufacturing has more than 2000 Indians who mostly work as traders. 15. 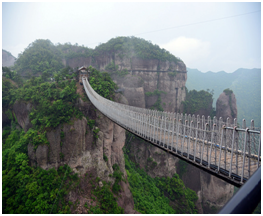 The beautiful mountains, rivers and historic sites of Zhejiang have attracted tourists from all over the world. 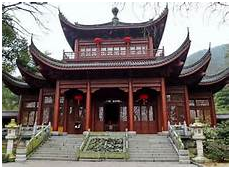 With the beautiful West Lake of Hangzhou as a central attraction, tourists can visit places of rich Buddhist heritage in Zhejiang such as The Lingyin Temple and Leifeng Pagoda in Hangzhou; the Ayuwang Temple (The temple of Ashoka) and holy Putuo Mountain in Zhoushan etc. The historic sites including the old Great Wall of Taizhou and Beijing-Hangzhou Grand Canal built in 6th Century AD are worth seeing. The landscape of Zhejiang is dotted with many picturesque places such as West Lake region, Thousand Island Lake in Chunan, the Small Three Gorges of Jiande, The tidal waves of Qianjiang River in Haining, the bamboo park of Anji etc.